Please join the C19 Anglophone Collective for an upcoming talk by Rachel Teukolsky, Associate Professor in the English Department at Vanderbilt University, and author of The Literate Eye: Victorian Art Writing and Modernist Aesthetics. 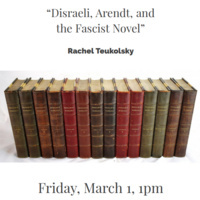 Her talk, “Disraeli, Arendt, and the Fascist Novel,” will be held in the Ide Room from 1–2:30pm on Friday, March 1, with drinks and snacks to follow. Abstract: What is the relationship between literature and power, and how did some nineteenth-century novels or artforms develop authoritarian values? My lens on the question is Hannah Arendt’s study The Origins of Totalitarianism (1951), which devotes a short, ten-page chapter to Benjamin Disraeli, the Prime Minister of Britain in 1868 and again from 1874 to 1880. I take Arendt’s brief insights as the starting point for investigating Disraeli’s aesthetics of the far right. The fact that a Prime Minister was also a novelist captures our attention, especially since his novels are thinly disguised political manifestoes. I argue that Disraeli’s novels Coningsby (1845) and Tancred (1847) belonged to a long Romanticism, opposing moves toward democracy, reason, and utilitarianism, and espousing values of beauty, passion, and eroticism toward authoritarian ends. The talk follows Arendt in observing a long durée of conservatism whose trajectory moves from the nineteenth century into the twentieth. (I also acknowledge and discuss the anachronism of using “fascism” as a concept by which to study a nineteenth-century writer.) The lecture will conclude with a turn to the conservative German theorist Carl Schmitt, who reputedly had a picture of Disraeli hanging over his desk, and whose authoritarian political philosophy shows striking echoes of Disraeli, linking both in a long Romanticism.